UPDATE: Using the LoopAlien with single lines, and faster locking method. I’m a sucker for cool, little hardware gadgets for tarp and hammock rigging. Don’t get me wrong, I love knots (I’m a Scoutmaster, after all), and use them on all my trips, but sometimes a good piece of hardware makes the task of tensioning and tying off a tarp or hammock just a little easier. When friends told me about a Kickstarter campaign for a little device called the LoopAlien, I was curious. I ended up backing the project after seeing the LoopAlien’s potential, and to support innovation. When David, the LoopAlien creator, offered to send me some prototypes, I gladly accepted; call it a pre-shipment for my investment in the project. I’ve been having fun playing and experimenting with these little devices for the past several days. The trouble with the LoopAlien may well be it’s greatest strength: there is no set way to use it. My main goal was to see if I could use them to set up and tension a tarp, so my efforts have been focused to that end. What’s intriguing about the LoopAlien is that you can get away without tying any knots in order to use it. Of course you can use knots, but by using loops (or bights) along the line, you can quickly attach and detach the line from the hardware. 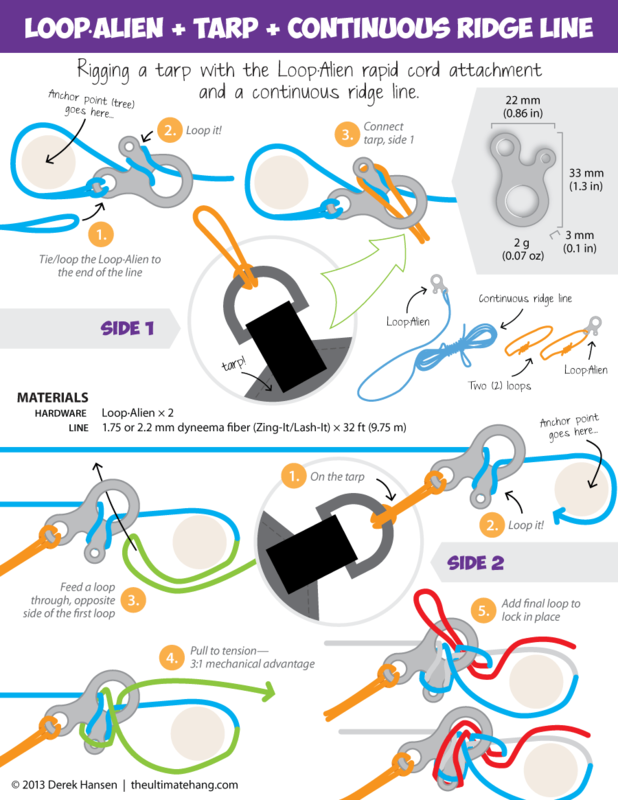 The following illustration and video demonstrate how I used two LoopAliens to rig a tarp with a continuous ridgeline without any extra hardware. I managed to get the LoopAlien to hold fast without slippage and get a 3:1 mechanical advantage to really get the tarp taut. All-in-all, I’m happy with the results. The LoopAlien makes it easy to set up and the line is easy to un-hook once I’m ready to pack up. I also used the LoopAlien to rig up a bear bag using the PCT Method. Attaching the LoopAlien to the cord is pretty simple, and the line glides smoothly through the holes in the device much better than mini carabiners. I should note that while Dave sent me a pair to evaluate, I’m not being paid to endorse or support his project. Where can you get these? Ah! I missed the URL. I’ve fixed that (sorry!). The LoopAlien is currently on Kickstarter, but they are fully funded and will launch soon. The LoopAlien will come out in aluminum, stainless steel, and titanium. So how would you compare this to something like the DutchWare Tarp Flyz? First off, I don’t think it’s as obvious how to use the LoopAlien compared to the TarpFlyz. That novelty will likely wear off with use and popularity. Remember when the Figure-9 first came out? Nitize (as they do with most of their gadgets) had to do some PR work to tell us _why_ we needed this and _how_ it worked. Good instructions will help. As I mentioned before, the LoopAlien’s greatest weakness is probably its strength: there is no one set way to use them. I toyed around with lots of configurations to string up a tarp. There are plenty. What I finally settled on and showed in the video and illustration is what worked best for me, but also for what I was trying to do: quickly hook up and tension a tarp. I’ll be honest, I wasn’t sure I’d be able to tension the tarp at first. The 3:1 mechanical pull was an ah-ha! moment and I’m very pleased it works as well as it does. Besides tensioning, I worried about slippage. In all my testing, when I connect the LoopAlien as described in my illustration, I experienced no slippage. Can slippage occur? Yes, if you wrap it in a different way. I love experimenting with these gadgets, and since the LoopAlien offers so many variations, it’s kept me up many a long night. Cost aside, which metal version would you say is the best to buy? For pitching a tarp, you won’t need anything more than the aluminum, and I’m sure the aluminum will be the most cost-effective. My question is, “what’s the load capacity of the stainless steel and titanium versions?” If the LoopAlien in steel is strong enough for human weight, you can bet there’s going to be interest in using them for hammock suspension. I’d love to get my hands on these stronger versions and test that out (again, if the load capacity is right). If they can’t bear enough weight, I’ll probably stick with the aluminum. The gram weenie in me just screamed out, “but the titanium version will be so much lighter!” True. I can’t deny that. So even if the titanium version can’t be used for hammocks, it could be worth the weight for some folks. Currently, the LoopAlien barely ticks off 2 grams on my digital scale. In titanium, would I even be able to get a reading? What do you make of this little doo-dad? How versatile do you think it would be outdoors? Very interesting. Without trying it out, I’m not sure. My initial worry is with snagging. It has a lot of sharp edges that could be problematic. Looks cool though. I finally gave in when they offered the Ti version of the Loop Alien. I also have a pair of Dutch Flyz on their way to me as well after seeing your continuous ridgeline video where the Fly(z) is attached to the tarp rather than the line. I’m hoping to try these items together and see how they work as a set. I can not wait till I get my set! Derek, thanks again for these instructional vids and showing the potential possibilities. In response to Eric L’s comment I use your continuous ridge line setup demonstrated with Dutch’s Singerz and Dutch hook and it works great. Quick, easy, and hard to beat that mechanical advantage for a taught tarp. Would you get the coveted “V” in your ridge line with the LoopAlien? Yes, you still can get the V. With the LoopAlien it’s not as easy to adjust on the fly as you can with my two carabiner or Dutch Hook methods by sliding back and forth to center, if you want to use the LoopAliens as I illustrate. I know a lot of folks set a static line and then use a pair of prusiks as the attach points for the tarp. This allows you to slide the hammock back and forth on the line and you can do this easily with the LoopAlien, but it doesn’t allow for the best V.
The key to the V is having your hardware (or connection point) right at the tarp, or as close as possible. This is why I try to eliminate adding extra pieces to the equation. Go for simple. Great job! Cant wait to get mine! This illustration is perfect! Thanks Jeff. 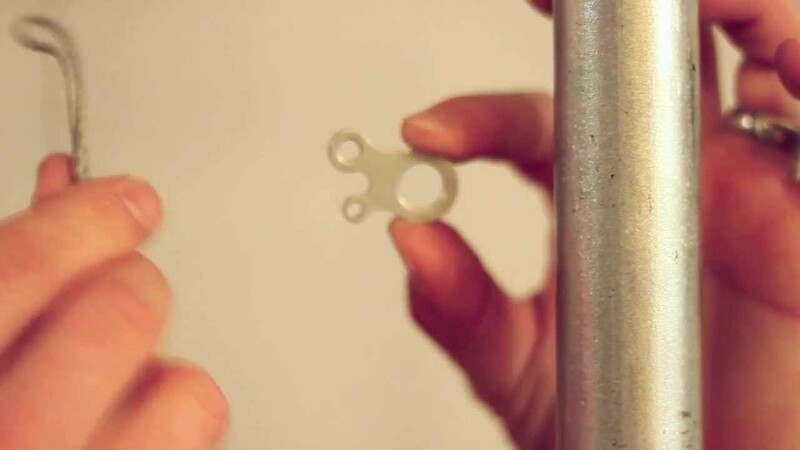 Check the blog later for a new video showing a new, and perhaps easier, way to “lock” the line on the LoopAlien. Thanks Derek, I just get the Dutchware Stingerz and Dutch hook down pat and you make notice of this new item. I am thinking I’ll stay with that system until the bugs are worked out with this. Yes, I understand. There are TONS of different hardware items on the market. I’m not really trying to favor one option over another, just trying to show how to use them. The LoopAlien is just another option. I’m about to publish a Part 2 on the LoopAlien to show how to use them with end-only ridge guy lines, plus a method to lock down the line in an easier, faster way. Watch for it soon! Dude, i am affraid,that titanium will never be lighter than al..Just because chemistry and stuff.It would have to be much thinner,but that would cut the rope.My opinion.